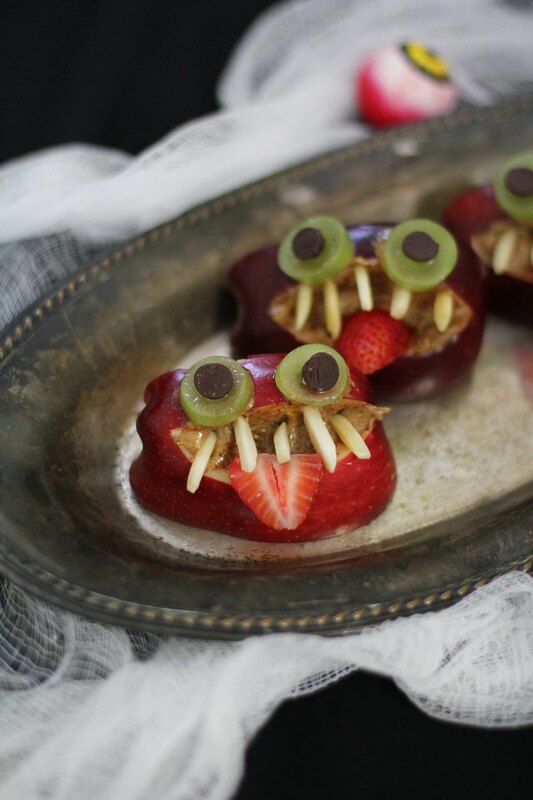 Between the parties, parades and costume contests, the Halloween season comes with its fair share of indulgent sugary treats. 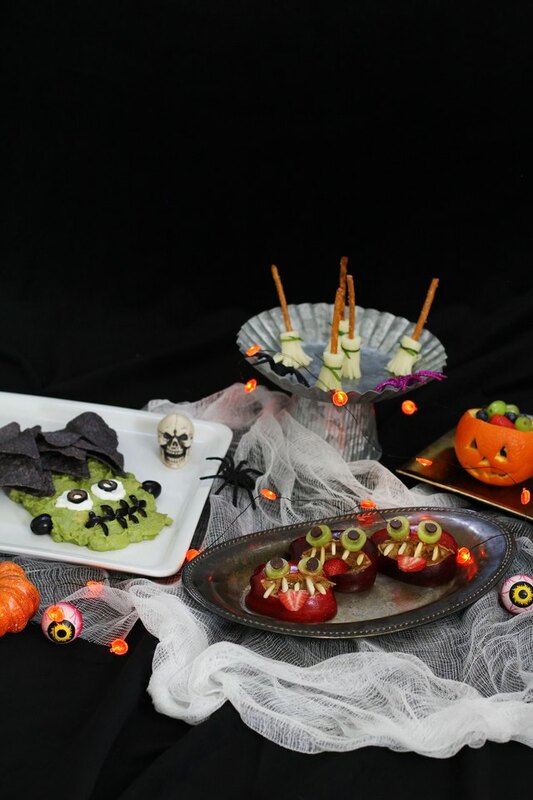 If you'd prefer to keep the candy confined to the trick-or-treat bags, you can still whip up some spooktacular snacks for your kids that are equally healthy, delicious and full of fun. 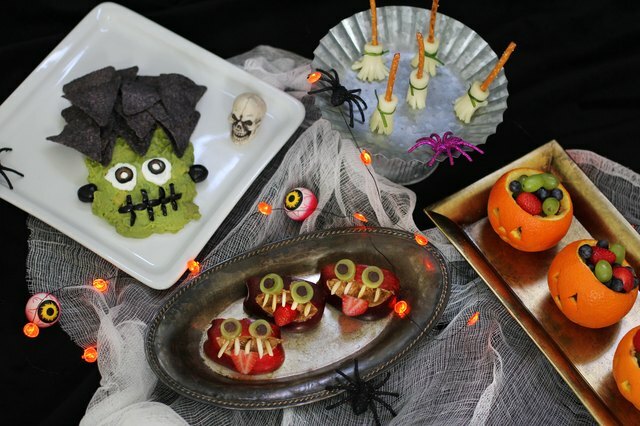 All of these snacks are super simple to assemble, require minimal ingredients, and would be wickedly festive for Halloween parties, classroom potlucks, or lunchbox treats! 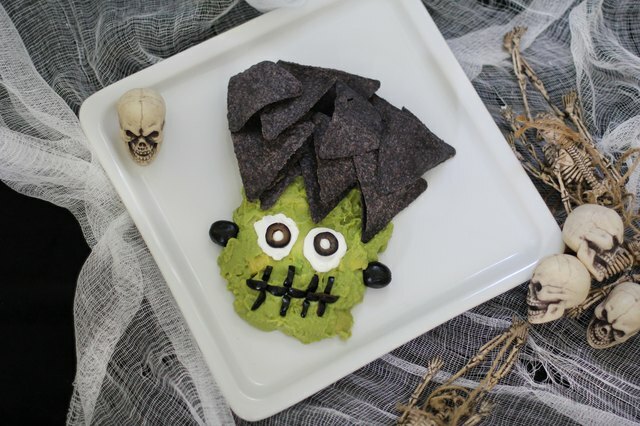 Spread guacamole onto a plate and form it into a rectangular shape. Place two dollops of sour cream in the center of the rectangle and spread the dollops with the back of a spoon so they form two white eyes. Put a sliced black olive in the center of each eye. Place a whole black olive on each side of the rectangle to resemble Frankenstein's "bolts." 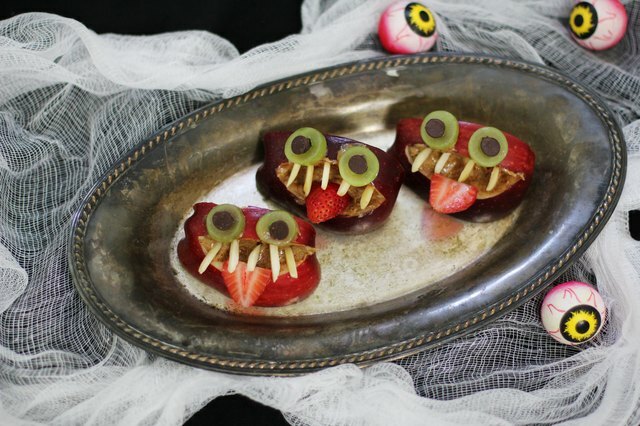 Arrange sliced black olive segments into a "stitched" pattern beneath the eyes to resemble his mouth. 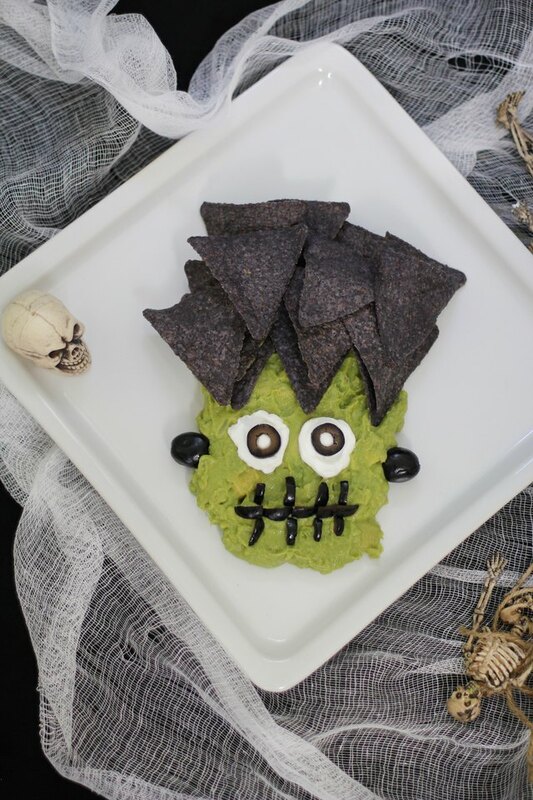 Place blue corn tortilla chips along the top half of Frankenstein's face to resemble his hair. Cut a string cheese stick into three equal pieces. 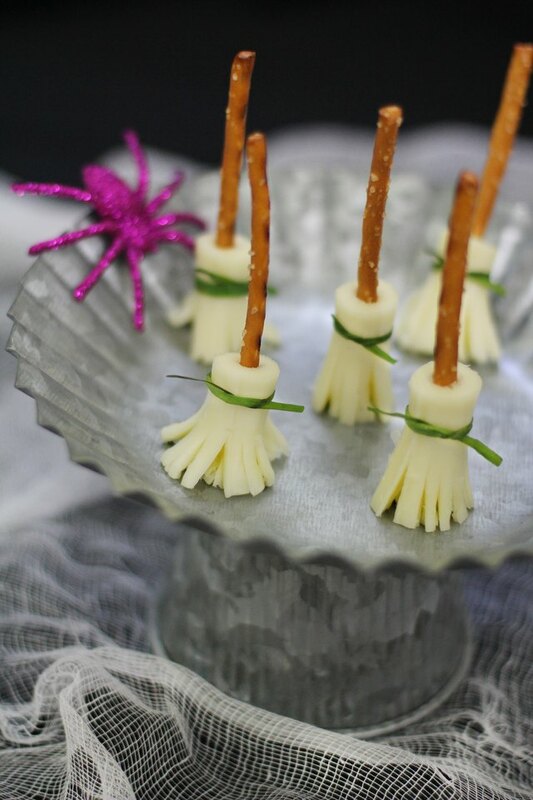 Pull apart the bottom half of each cheese piece, leaving the top half intact, so that the cheese strings resemble the bristles of a broom. 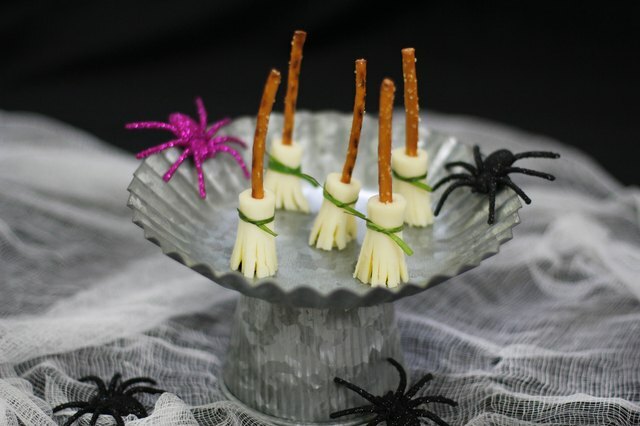 Insert a pretzel stick into the top part of each cheese piece. Tie a chive around each broom, just above where the "bristles" start. Cut an apple into quarters and remove the seeds/core from each slice. Cut a shallow wedge into the skin side of each apple slice. Spread any type of nut butter (ex: sunflower, almond, peanut) into the wedge. Place a strawberry slice in the center of the wedge to resemble a tongue. Stick slivered almonds (or sunflower seeds) into the top of the wedge to resemble teeth. Stick a chocolate chip into the center of a grape slice to resemble an eye, and use nut butter to secure two "eyes" to each apple slice. Slice the top off an orange. Hollow out the flesh of the orange (save to enjoy as a snack later). 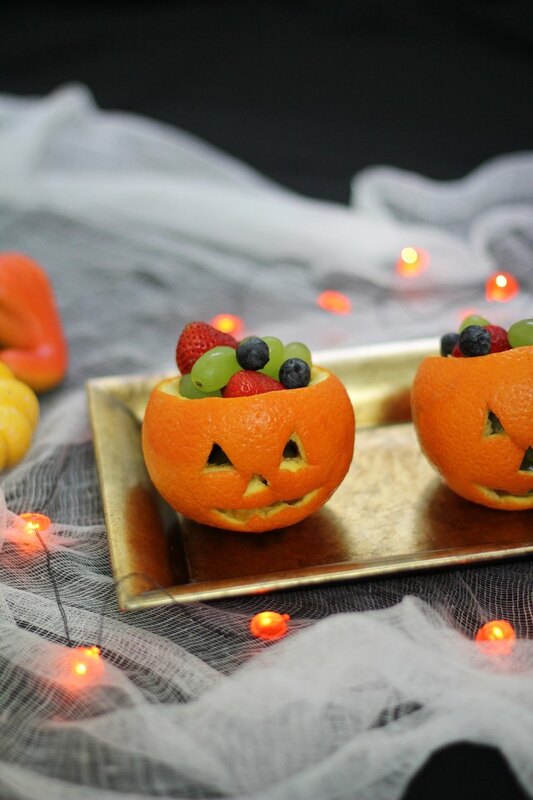 Carve a jack o' lantern face into the side of the orange. 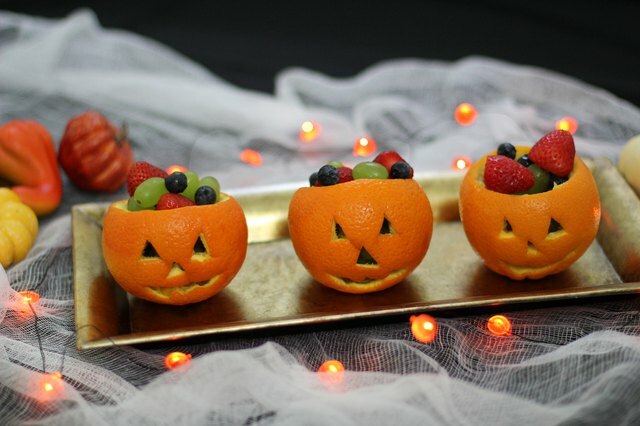 Fill the orange with assorted berries and grapes.